Yum Brands, the owner of fast food chains KFC and Pizza Hut, has reported an 18% jump in first quarter profit, helped by a rebound in sales in China. The firm made net earnings of $399m (£237m) for the three months to 22 March, up from $337m a year ago. Sales at outlets in China rose 9% from a year ago, with those at KFC up 11%. 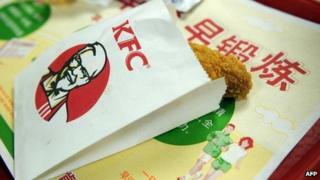 Yum's China sales had dipped after a report in late 2012 said two of its suppliers were providing chickens with excessive levels of antibiotics. Sales at KFC stores in China, one of Yum's biggest markets, had fallen by 15% in 2013, resulting in a 32% fall in profits for the year. The firm has previously said it has taken steps to address those issues and regain customer trust. Yum's chief executive, David Novak, said the latest numbers and the recovery in China indicated the firm was "clearly on its way to a strong bounce-back year". "Given the strength at both KFC and Pizza Hut, we expect to open at least 700 new restaurants in China this year as we further capitalise on our leading position in the number-one retail opportunity in the world," he added in a statement. Mr Novak also said the firm expected to see its profits rise by 20% this year.